Ruta del Sol Final Stage: Phoning It In! 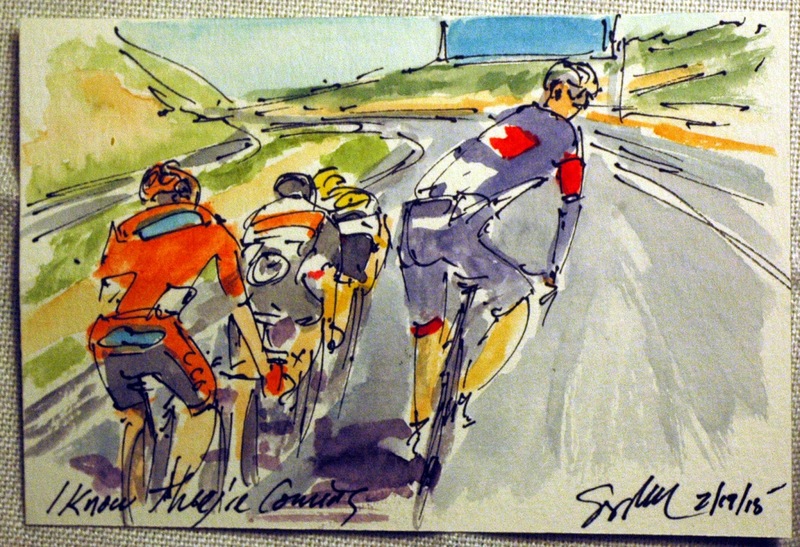 The 61st Ruta del Sol only featured two stages where the sprinters were able to contest the stage. There should have been three, but the first day the peloton was surprised by the late break from Pim Ligthart (Lotto Soudal). Of the two stages that did have a field sprint, Juan Jose Lobato (Movistar) took both victories with John Degenkolb (Giant Alpecin) managing second each times. I don't know what is the reason for the odd phone call victory salute of Lobato, but this season I have him take three sprints, and the has made this gesture every time. The race was the first meeting of Chris Froome (Sky) and Alberto Contador (Tinkoff Saxo), the pair couldn't have been more evenly matched. Each bested the other on a big mountain top finish and they finished first and second on the General Classification, with Froome winning by two seconds over his main rival for the coming Grand Tours. This is a small original watercolor and ink painting that is available through my artist website at www.greigleach.com. Yes, international shipping is available. To purchase this particular painting, just follow the direct link at the end of this post. 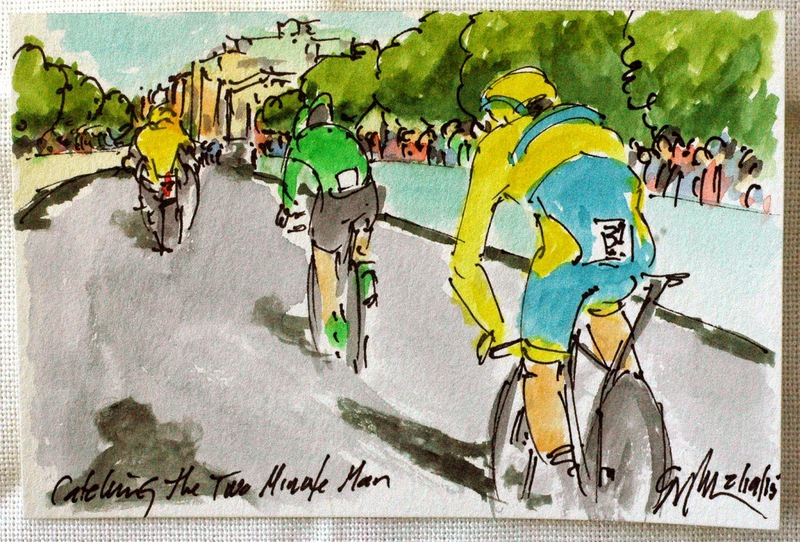 If you have enjoyed reading about bike racing with the accompanying artwork please be sure to check out my new book, "Book de Tour - Art of the 101st Tour de France" The book is available through most online book stores worldwide. Just Google the title to find where you can purchase the book and avoid international shipping charges. After the peloton finally pulled back Paterski (CCC Spandi), Edward Theuns (Topsport Vlaaderen) thought he would have a go at jumping the sprinters. The final two kilometers were seemingly straight up to the finish. Theuns waited for one of the Lotto Jumbo NL riders to swing off and in the loll, launched his big move. With a much shorter distance to go, he had a slightly better chance of making it alone to the line, but yet again, it was still a long shot. Or should I say, short shot? Apparently, Maciej Paterski (CCC Spandi) just kept riding people off of his wheel until there was no one back there. With only 16 kilometers left to go he had 27 seconds on the peloton and the sprinter's teams. He was actually looking like he had a chance to pull of the surprise and rob the fast men of their glory. Put it was a long shot and a long way to go. Maciej Paterski (CCC Spandi) was feeling good on the final day of racing, he seemed to drag the rest of his break away companions along, thinning the group out in the process. With less than 30 kilometers left to race, the original six was now down to three. Those that were able to hold the Polish rider's wheel, Merhawi Kudus Ghebremedhin (MTN-Qhubeka) and Johnny Hoogerland (Roompot). Hoogerland always sticks in my mind as the most unfortunate rider from a number of years ago in the Tour de France. He was the rider who was hit by a VIP vehicle during an Alpine stage and knocked into a barb wire fence. 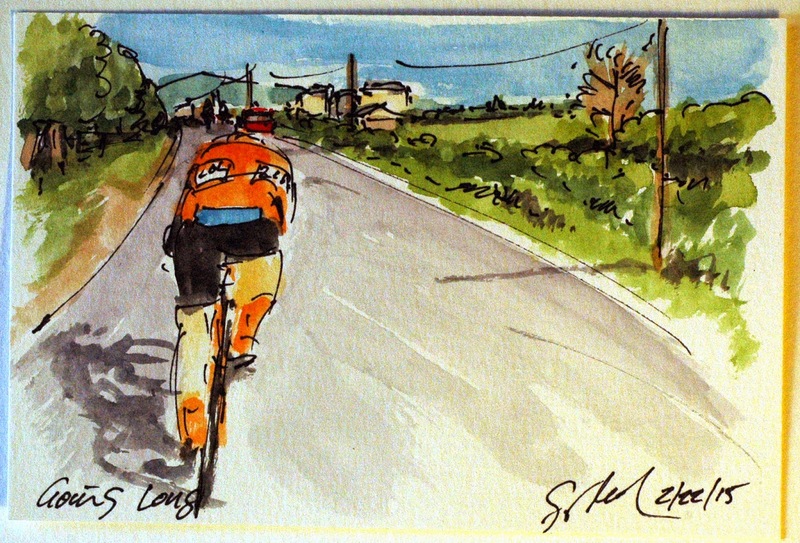 The inspiring part of the story, he got back on the bike a finished the stage. That night, he went to the hospital to get something like forty stitches, then lined up for the start the next day. These are hard men who race in tight lycra! As per usual, the final stage of the Ruta del Sol had the requiste early breakaway. This time one team managed to put more than one rider into the group. With only six riders in the break, two of them ride for MTN-Qhubeka (my vote for the best kit in the peloton). The group was comprised of Merhawi Kudus Ghebremedhin and Jim Songezo (MTN-Qhubeka), Dario Martin Hernandez (Burgos BH), Johnny Hoogerland (Roompot) and Maciej Paterski (CCC Spandi), With today's stage the last chance for the sprinters to show their legs, this break wasn't given more than a two minute gap on the peloton. Giant-Alpecin was still looking for a stage win for their man, John Degenkolb. This is a small original watercolor and ink painting that was created using Yarka St. Petersburg watercolors and Steve Quiller brushes from the family run art supply company, www.richesonart.com. In additon, this painting is available through my artist website at www.greigleach.com. Yes, international shipping is available. To purchase this particular painting, just follow the direct link at the end of this post. Starting the day 27 seconds down on Alberto Contador (Tinkoff Saxo), Chris Froome (Team Sky) had high hopes of besting his main rival. It was truly a tall order given the brilliance of the former's ascent of the previous stage's final climb. When it came down to just the pair of adversaries I think everyone was surprised that unlike yesterday, it was Froome who road away and Contador who was unable to hold the wheel. 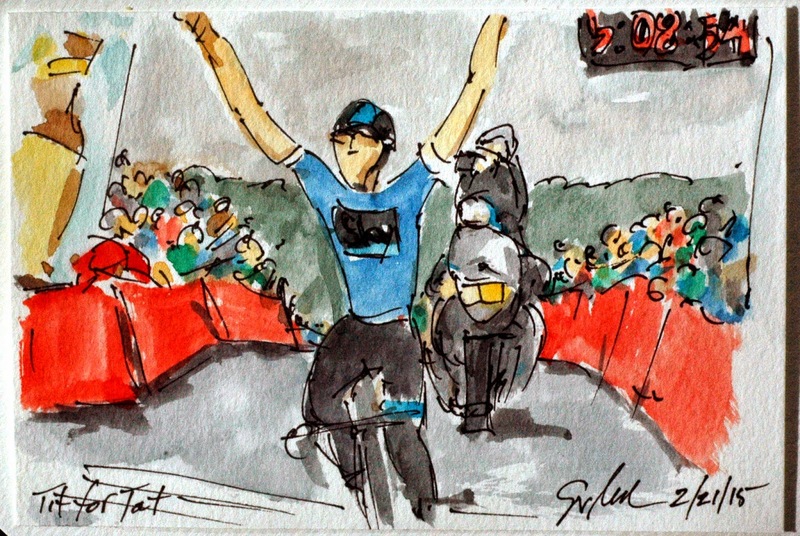 As Froome joyfully threw his arms in the air as he crossed the line, it only remain to be seen if he had put enough air between himself and the agile Spaniard. The second surprise of the stage, he finished 29 seconds ahead of Contador which meant that he would start the final stage in the bright red of the Leader's Jersey. 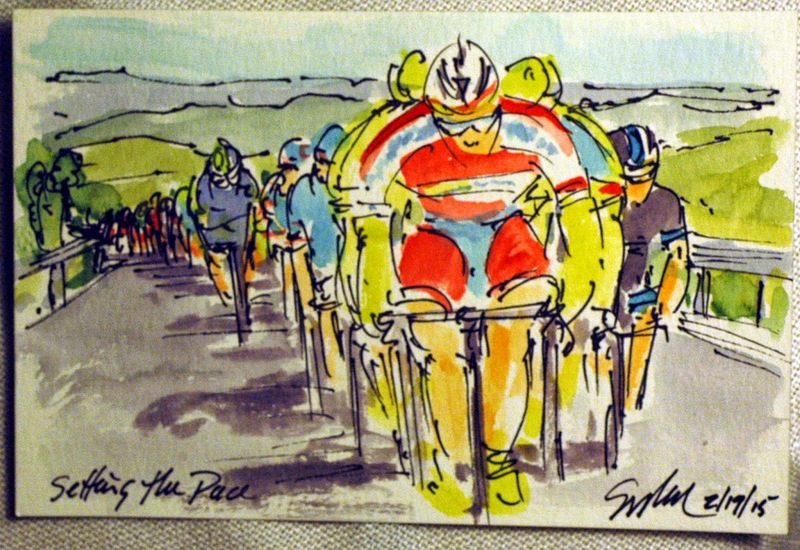 This is a small original watercolor and ink painting that is available through my artist website at www.greigleach.com. To purchase this particular painting just follow the direct link at the end of this post. And yes, international shipping is available. 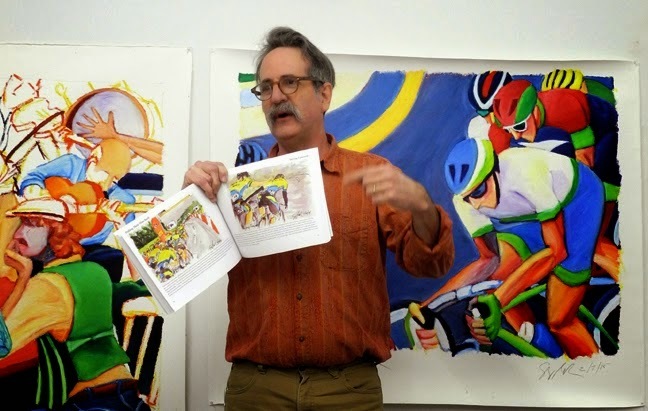 If you like reading about cycling along with original art, be sure to check out my "Book de Tour - Art of the 101st Tour de France" available online world wide through Amazon and other online book retailers. 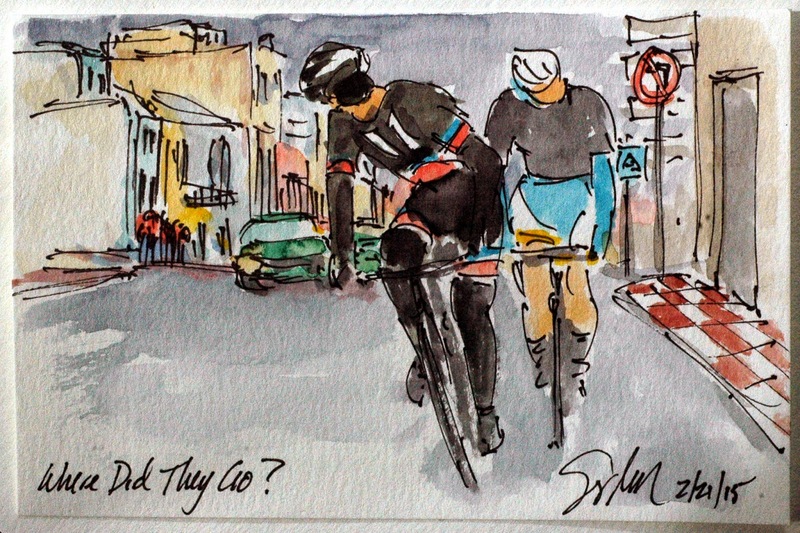 The final card played by Team Sky was Mikel Nieve, once he could no longer hold the high pace on the 20% gradient, it was time for the two biggest names of the ProTour to fight it out for the overall. Chris Froome (Team Sky) wearing the blue points jersey (on loan from Contador), feeling the sting of getting dropped in Stage 3 by the Spaniard, Alberto Contador (Tinkoff Saxo) hit the front attacking hard striving to drop the pedal dancing two time Tour de France winner. Despite the severity of Froome's attack, it look like the two were going to go up the mountain pedal stroke for pedal stroke. I was quite surprise what happened as soon as I finished painting this watercolor. Team Sky wasn't happy with how they got out played by Tinkoff Saxo at the finish of Stage 3. So they decided they would hope that their rivals pace setting before the final climb would leave Alberto Contador (Tinkoff Saxo) isolated on the ascent. Team Sky had the luxury of multiple cards to play since they started the day with three riders in the top ten on the General Classification. Nicolas Roche (Team Sky) was the first to lift the pace, with Peter Kennaugh (Team Sky) in his British National Championship jersey being the first to attack the peloton and the leader's jersey. Sitting in reserve was Konstanstin Siutsou all in hopes of getting Chris Froome on top of the leader board. As I have said the nine man break split apart, leaving riders all over the road. At this point Greschke and Selvaggi were extending their lead on these three and the peloton. Four others had already surrendered and been picked up by the Tinkoff-Saxo led peloton. That left Hugh Carthy (Caja Rural-Serguros), Eugene Duyn (Team Roompot) and Romain Sicard (Europcar) stuck in the middle, in the oft called "no man's land." 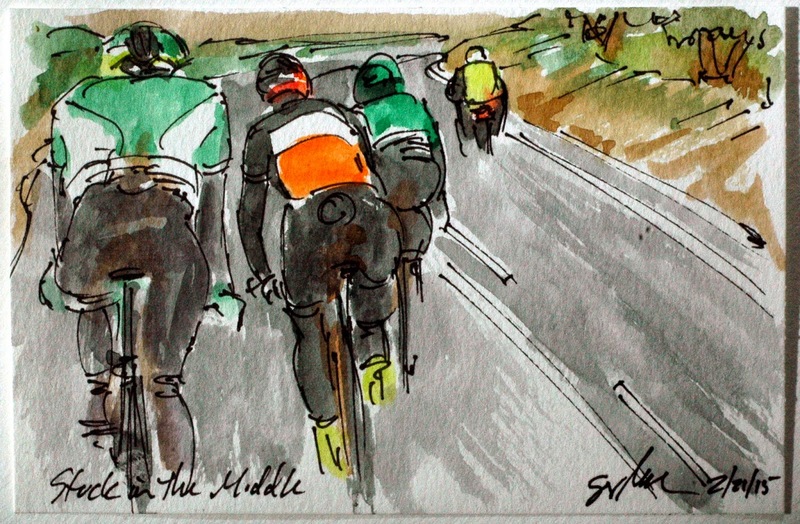 The trio was hoping that it would be the two ahead that they would see first rather than hearing the whirring sound of the spinning wheels of the peloton. The weather became another competitor in today's stage, the combination of muddy roads, cold, wind and rain, followed by an emerging rays of sun. 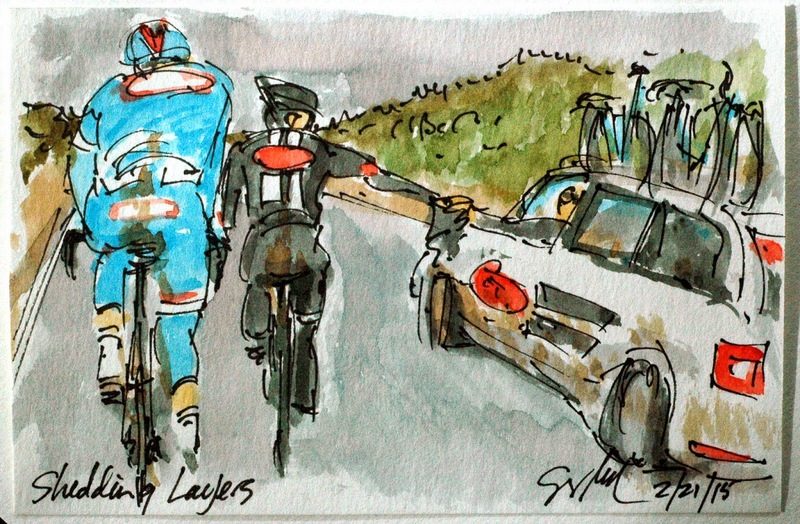 The riders were hard pressed to get their clothing right, the right amount of layers, arm warmers, vest, rain capes were constantly being handed back and forth between riders and their team cars. At some points, racers would simply pass gear to different team cars figuring it would get sorted out at the end of the day. Simon Greschke (Giant-Alpecin) took heart from is early escape from the break, to press on in earnest, this time he had the big man from Wanty-Groupe Gobert, Mirko Selvaggi, along for the ride. Greschke must have been feeling really strong as he rarely forced Selvaggi to do his share on the front. Ruta del Sol Stage 4: Where Did They Go? The penultimate stage of the 61st edition of the Ruta del Sol brought a cold wet day to add to the challenges of 199.8 kilometers and a very steep climb to end the stage. The early break for today was made up of nine riders from nine different teams. The group started to disintegrate at about 145 kilometers into the stage. 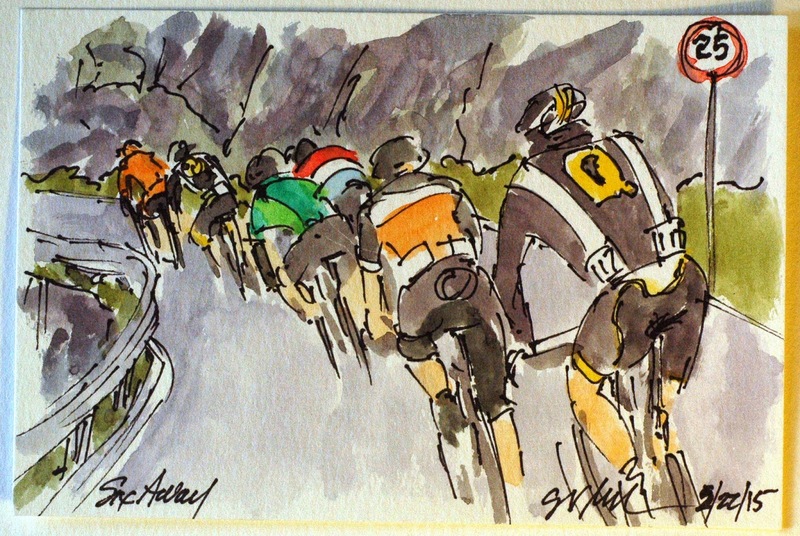 At one point, as the break whipped through town, Simon Greschke (Giant-Alpecin), with Pieter Jacobs (Topsport Vlaanderen) on his wheel, looked around to discover that the rest of the group hadn't held his wheel. The pair decided it was too far to go it alone, so they sat up and waited for the others. 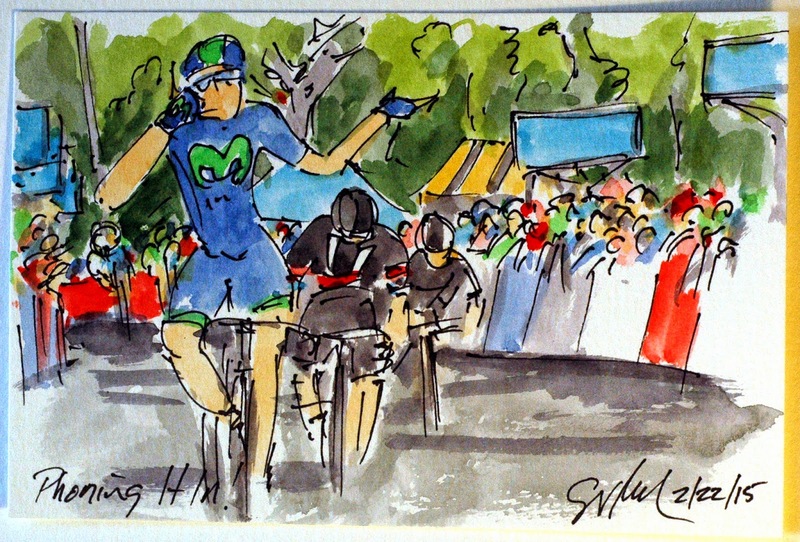 At this point Greschke may have started planning an attack later on in the stage. This is a small original watercolor and ink painting that was created using Yarka St. Petersburg watercolors and Steve Quiller brushes from the family run art supply company, www.richesonart.com. In addition, this painting is available through my artist website at www.greigleach.com. To purchase this particular painting just follow the direct link at the end of this post. And yes, international shipping is available. With his arms stretched wide, Alberto Contador (Tinkoff Saxo), cleared the summit of the climb with just a few more meters to the finishing line. As he crossed the line he gave his customary pistol salute. He can now be confident that he has good form and that he was able to drop one of his main rivals in the mountains. However, he is seasoned enough to know that there is still another mountain top stage in this race, and thousands and thousand of kilometers to race before the end of the season. A season that may be close to his last. Sorry, I am having technical difficulties and can't load the image, hopefully later. In the mean time, you can see the artwork at my website, just follow the direct link at the end of this post. Once the reduced peloton hit the 18 percent gradient of the final climb, it was the veteran, Ivan Basso (Tinkoff Saxo) who dragged his leader, Alberto Contador, off the front. The pair simply road everyone else off of their wheels. This race has been billed as the first big show down between the two big men of the peloton, the other being Chris Froome (Sky), both of whom crashed out of the 2014 Tour de France. With Froome no where in site, it seems like the first head to head race was going to go to the Spaniard, Contador. Ruta del Sol Stage 3: Who Is Still Here? Tinkoff Saxo was a team with a plan today, a plan that they seemed quite capable of bringing to fruition. 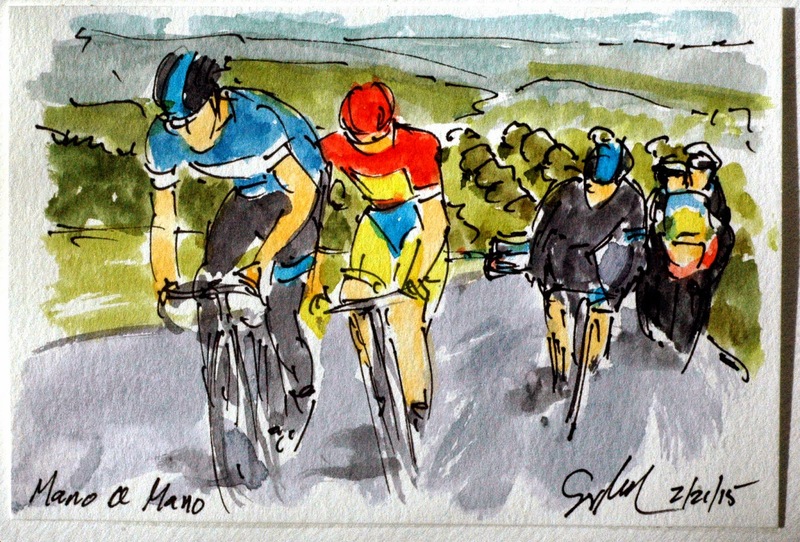 With the end of the stage a 17 kilometer climb up to Motril Haza Llamas, Sergio Palinho lead is team leader, Alberto Contador, up the lower slopes, glancing back to see just how many riders he was able to shed from their wheels. Palinho had the veteran, Ivan Basso, on his wheel and then the red jersey of race leader clad Contador. Contador seemed to be doing the entire climb in his traditional pedal dancing style. There is never a good time to have a flat tire, all the more so when you have been out in a good size break away for the lion share of a long stage. So it was for Aleksejs Saramotins (IAM Cycling) as he patiently waited for the team mechanic to change is front wheel. Notice that he his helping his man out by holding the bike just high enough to make the wheel swap go as quickly as possible. Unfortunately, it wasn't fast enough to enable Saramotins to rejoin the break away. Having technical difficulties loading images, check back later to see the painting here. Or you can follow the link at the end of this post to see it at my website. Stage 3 of the Ruta del Sol, was lead out by a large break away. With the nine man group trying to slip away, the peloton was in no mood to give them more than a two minute leash. 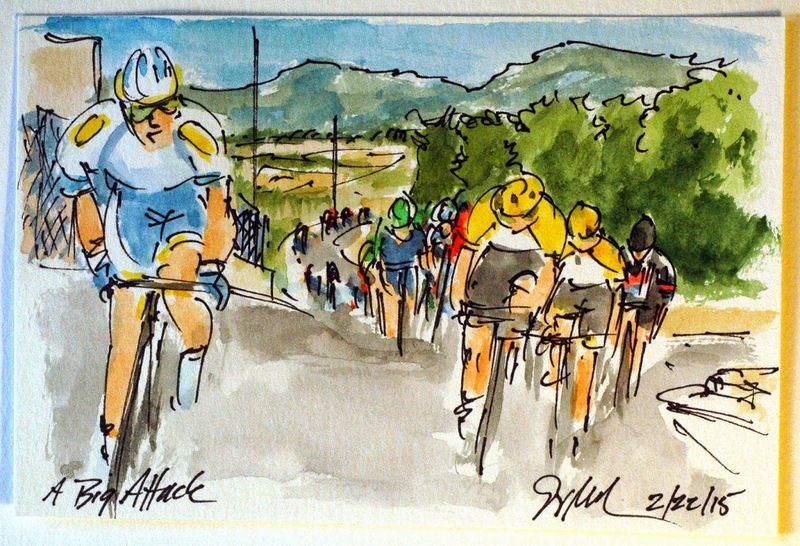 As they crested one of the earlier climbs on the stage they squeezed through the narrow streets of Agron. Tucked onto the back of the group are Alessandro Bazzana (United Healthcare), Jeremy Roy (FDJ), and Miquel Angel Rubiano (Colombia). This is a small original watercolor and ink painting that was created using Yarka St. Petersburg watercolors and Steve Quiller Brushes from www.richesonart.com In addition the painting is available through my artist website at www.greigleach.com. To purchase this particular painting just follow the direct link at the end of this post. And yes, international shipping is available. Ruta del Sol Stage 2: Of Course! With a category 3 climb close to the finish no one expected to see two sprinters fighting it out for the stage. With just under two kilometers left to race, it was Alberto Contador that made the first move. Once the peloton had him back in the fold, it was time for the real fast men to show how they earn their paychecks. Juan Jose Lobato (Movistar) had the legs to distance the other fast man from Giant-Alpecin, John Degenkolb. After flashing his trademark phone call salute at the line, Lobato held out his arms as if saying. "Of course I got the win." This is a small original watercolor and ink painting that is available through my artist website at www.greigleach.com. To purchase this particular painting, just follow the direct link at the end of this post. If the leader's jersey is on the back of a member of your team, it is your job to set the pace on the front of the peloton. 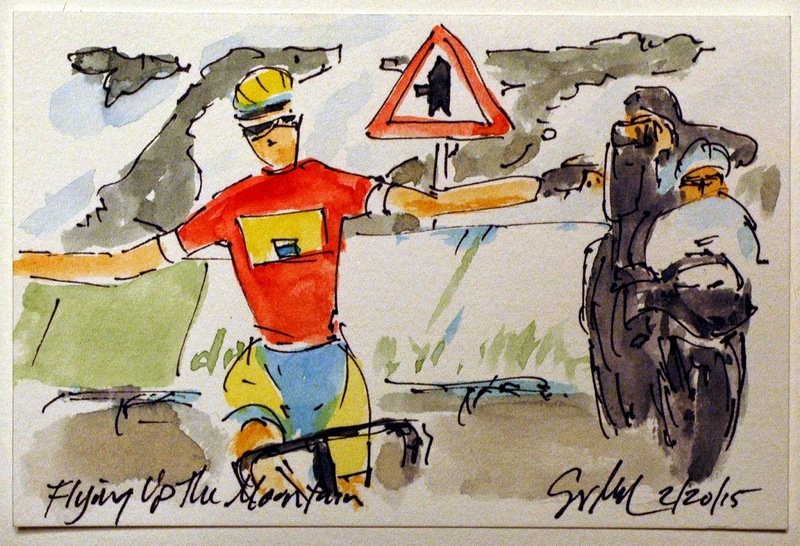 Tinkoff Saxo is no stranger to this rule, or to the hard work that it requires. Their team leader, Alberto Contador, has led many a ProTour race and the Ruta del Sol is just another race he hopes to add to his palamares. While this race's leader's jersey is red, it is the Danish National Champion that is on the front breaking the wind for the rest of the team. This is a small original watercolor and ink painting that is available through my artist website at www.greigleach.com. To purchase this particular painting for only $50 USD, just follow the direct link at the end of this post. International shipping is available. Most often a break away is caught by the peloton, and today was going to be no exception. With just about 20 kilometers left to race, Pirim Lang (IAM Cycling) swung out of the pace line to look back for the charging peloton. The original group of five were now down to four, the others being, Nick Dougall (MTN-Qhubeka), Sjorea Van Ginneken (ROO) and Adrian Honkisz (CCC Polkowice). While getting into the break faces all most certain failure, it still is better odds of winning a stage than hanging out in the peloton. Plus it gives valuable air time to the team sponsors. 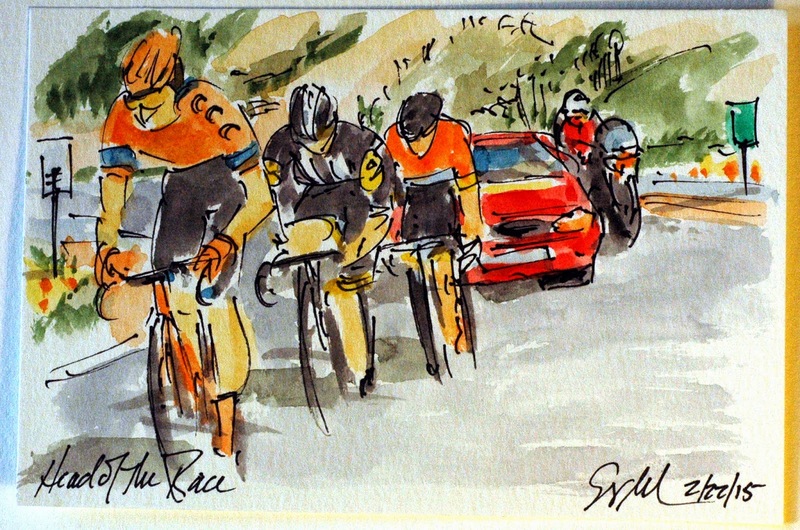 Stage 2 of the Ruta del Sol saw a five man break away gain over 6 minutes on the peloton. It was a long stage of 195 kilometers with a category 3 climb at the end, so the peloton was happy to let this group try their luck. 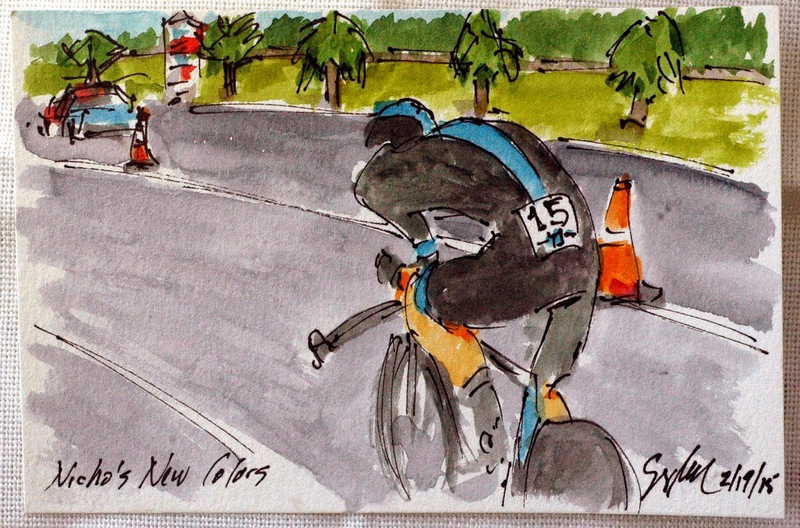 The break was comprised of only one ProTour team and included: Pirim Lang (IAM Cycling), Nick Dougall (MTN-Qhubeka), Alexsandr Komin (RussVelo), Sjoera Van Genneken (sorry all I got was ROO for his team) and Adrian Honkisz (CCC Poklowice). At this point all of these men were virtual leaders on the road. Although they still have 80 kilometers to the end of their day, and I don't see Alberto Contador (Tinkoff Saxo) giving up his leaders jersey that easily. This is a small original watercolor and ink painting that was created using Yarka St. Petersburg watercolors and Steve Quiller brushes from www.richesonart.com. They are an excellent family run art supply company based in the Midwest of the United States. This painting is available through my artist website at www.greigleach.com. To purchase this particular painting for only $50 USD, just follow the direct link at the end of this post. International shipping is available. 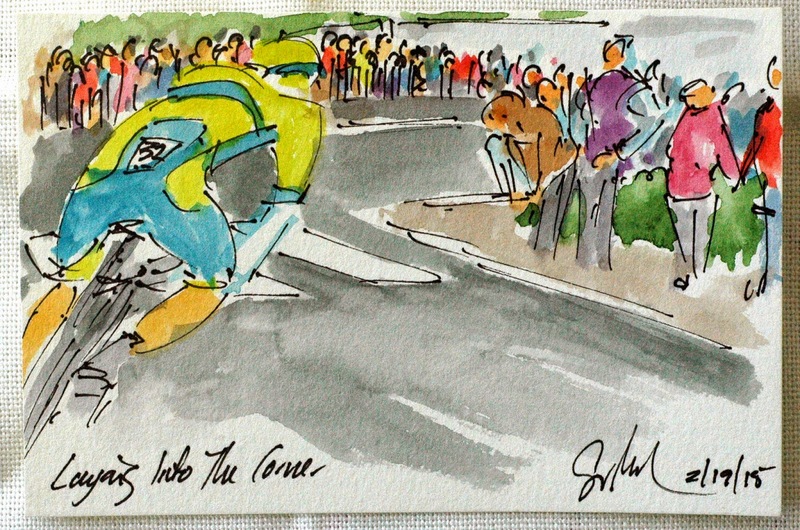 Alberto Contador (Tinkoff Saxo) hit the streets in fine form. With the riders starting at two minute intervals, it bodes well that he was able to catch the rider that left the start gate ahead of him. Contador having crashed out of the 2014 Tour de France, quickly regained form to win the next big tour, the Veulta Espana. Apparently, he has carried his form into his start of the 2015 ProTour season. Today's effort, while not enough to when the stage (he finished 4th on the day), it was enough for him to don the Red Jersey of race leader. It looked like most of the town turned out to watch the fast men in lycra speed through town. They cheered everyone including one of the senior statesman of the sport, Italian Ivan Basso (Tinkoff Saxo), who laid down a very competitive time in the second half of stage 1. This is a small original watercolor and ink painting created using Yarka St. Petersburg watercolors and Steve Quiller brushes from www.richesonart.com. In addition this painting is available through my artist website at www.greigleach.com. To purchase this particular painting, just follow the direct link at the end of this post. I spent Valentine's Day talking with a group of about twenty five artists and art lovers. The group was the Metro Richmond Artist Association. I was there to talk about my art and how to work with Shiva Paintstiks. You can see the Paintstiks in my left hand in the first picture. I brought along my most recently completed painting (see the previous blog post) with two other completed paintings. In order to be able to show the participants in the workshop, I also had an incomplete work to illustrate my process. Naturally, the question and answer period was wide ranging covering everything from being a professional artist, using social media to promote one's work and cycling. Most particular my book, "Book de Tour - Art of the 101st Tour de France". In the second photo, I am holding the book and telling the story of Alberto Contrador's abandonment and how my artwork was used by International Media to relate the story. Both of these photographs were taken by one of the artists (and in her case authors) in attendance, Mary Montague Sikes. To see these paintings go to my artist website at www.greigleach.com, you can find the book there, too. In addition to the small cycling watercolors, I also do large scale Shiva Paintstik paintings on paper. 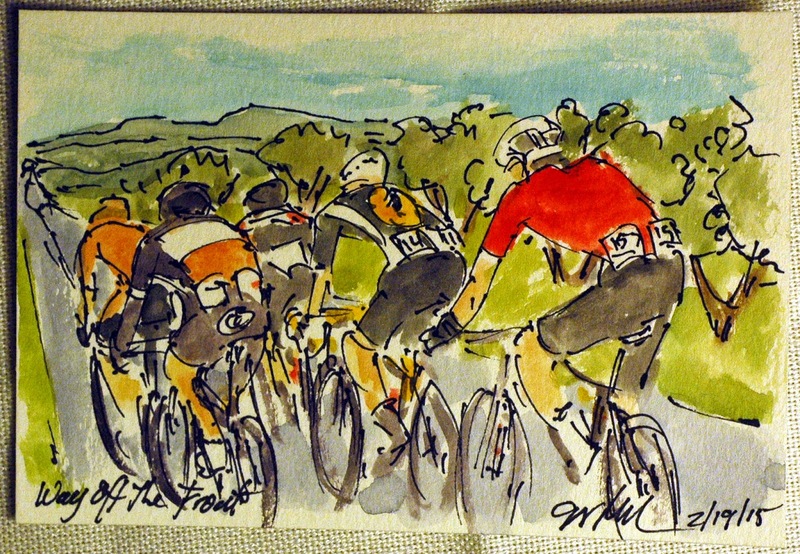 Actually, the Paintstik works came long before I started the project of painting cycling events live. The large scale works like this one can be quite big, this one is 44"x52" and take considerably longer to create then the postcard sized watercolors. 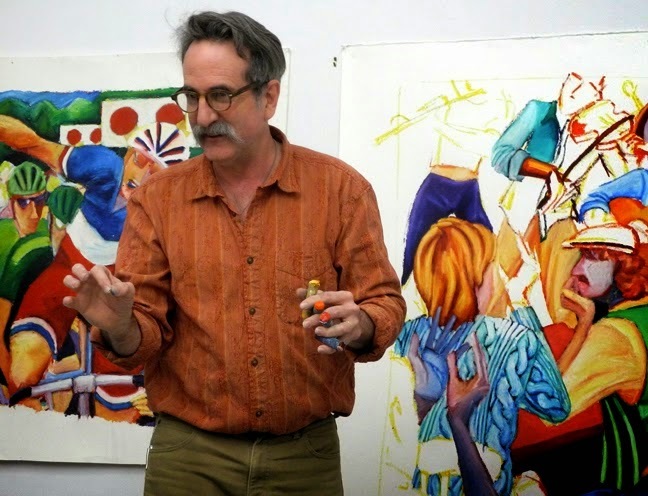 The subject matter varies widely, but all of it reflects what I am interested in, figurative pieces are all slices of my life. Many of them are created from remember moments in time. The work can be very specific, but it frequently coveys an everyman perspective on life. Regardless of where we are, we are all dealing with many of the very same issues. 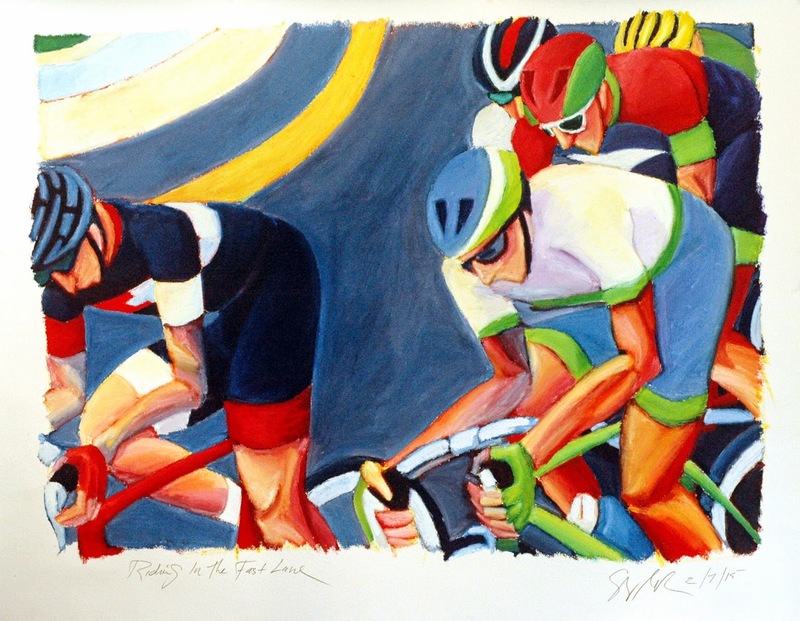 This painting is entitled, "Riding in the Fast Lane". For the large oil pieces, my wife, Bridget, is the one to create the titles. She was once referred to as the "titler" in one of my exhibition reviews. 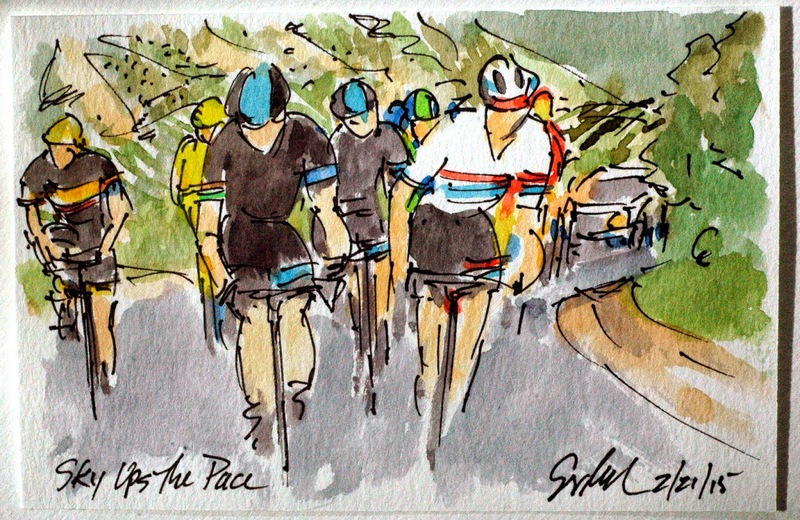 This piece is loosely based on one of my watercolors of the final stage of the Tour Down Under. The painting is available through my artist website at www.greigleach.com. While you are there, why not take the time to look at more of my figurative work. To reach this painting just follow the direct link at the end of this post.